Dark corners of a room seem to creep and reach out as the midnight clouds steal the last remaining shards of moonlight. Memories of smokey dreams are lost within your mind. Ruminating over the scent of mystery and nightfall, the fire you went through drifts along the air, the spices of heartache linger on the skin. Assured, you know morning will come, the darkness will subside, and the theory that everything remains dreadful will be smashed and broken. And yes, the juice could conceivably fit such a description. A little thread of blood orange lightens and sweetens the opening, then it's all bold and dark and smoky and spicy. It's not overtly boozy, really, but wearing it made me think of drinking a single malt scotch while smoking a pipe filled with spiced tobacco (not that I'd know). A mild vanilla almost, but not quite, tames the heavy woods and incense; nothing really tames the tobacco smoke. I put Broken Theories into my incense box, but if I'd waited 30 minutes, it would have gone right in my tobacco box: it's really just as much about the tobacco (or arguably, the woods: you could put it into whatever box pleases you). I should think it would be overwhelming in hot weather. It lasts for ages. Verdict: If you've ever worried that the smoke notes in your fragrance were uncomfortably close to the smell of cigarette smoke, or if you're a woman who finds tobacco notes possibly too masculine to wear, then Broken Theories is probably not for you. I found it great fun, and would recommend it as a perfect fragrance to warm you up on a dreary winter evening. It would indeed go nicely with a single malt, or an orange liqueur, while sitting by the fire. If you want a sweeter, more focused tobacco, then you might want Serge Lutens Fumerie Turque (or possibly Chergui). If you want an easier to wear tobacco, do try Ineke Field Notes From Paris (Kevin calls it an orange blossom fragrance, but I have always kept it in my tobacco box). If you want to spend more, try Tom Ford Tobacco Vanille (sorry, I couldn't resist, I know everyone loves it but me); if you want to spend less, try L'Occitane Eau des Baux. The quick poll: what's your favorite smoky fragrance (tobacco or otherwise), if you have one? 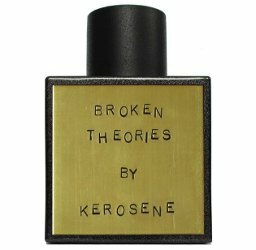 Kerosene Broken Theories is available in 100 ml Eau de Parfum, $140. The notes include blood orange, tobacco, spices, vanilla beans, sandalwood, oud and incense. For buying information, see the listing for Kerosene under Perfume Houses. Favorite smoky frag is also an indie–DSH’s Le Smoking, which doesn’t skew too masculine for my tastes. The Shalimar Ode a la Vanille (think it’s the Mexique iteration) also has a very smoky/non-sugary vanillic drydown, smokier than Shalimar. Ah, that’s a good DSH. Agree about Ode à la Vanille. Wearing it today and loving every bit of its smoky vanilla dry down. Not much for tobacco (I ostensibly like but in practice never wear Eau des Baux and Spicebomb), so my cop-out “smoky” choice is Vanille 44. Or L’Air du désert maybe? Ish? Thanks for the review, Robin–pitched as an incense fragrance, this would have gone on my mental to-try list, so I’m glad to know it leans tobacco before I go chasing down a sample. FWIW, Field Notes has always been in my tobacco box too! And of course Kevin is crazy! Although I do like the mix of tobacco & ob in Field Notes. So true about orange blossom being a nice pairing with tobacco. And, thinking of it from Kevin’s perspective, I will concede that if I spent more of my time wearing men’s scents, orange blossom might quickly become the much more distinguishing feature in any composition in which it appears, when compared with the pretty ubiquitous-for-masculines tobacco note! I love tobacco in perfume, and should add Back to Black to the list. Straightfoward, but totally delicious and a decant lasts for ages, since it’s so strong. Ah, I always forget about that one, thanks! My favorites are SSS Fireside Intense, which smells just like a campfire to me, CdG Man 2, which has a distinctly smoky smell, kind of like a distant wildfire, and Union Gunpowder Rose, which has a note like a burning sparkler. Love the 1st 2, still haven’t tried any of the Union scents…wish they’d get a US distributor. I like campfire smoky but not ash-tray smoky. Mostly I register cigarette smell, not from tocacco notes, but from some unknown combo of synthetic woods. Anyway, tobaccos I like are SSS Tabac Aurea, Volutes, and ELDO Jasmin et Cigarette is nice. I just tried MFK Cashmere Oud which had a cozy smoky vibe. Oh yes, Jasmin et Cigarette is one I would wear, except that it smells so exactly like–ha ha, sorry for the pun–an old flame of mine. I’m in no hurry to revisit those memories, but he did smell kind of amazing. Did he wear a fragrance, or just smoke? He did smoke, but how he also smelled like jasmine remains a mystery to this day. If we were on a long car ride together, I’d arrive smelling like an ashtray while he smelled like, well, an ELDO! Confounding. Ha! Confounding indeed. Although I don’t get cigarette smoke from the ELDO. Must resample. La Via del Profumo’s Tabac is my favorite tobacco scent. Not sweet. Not smoky either. For smoke, I like Tom Ford London. and several others whose names escape me at the moment. See, if I were at home, I could consult my spreadsheet and sound all intelligent on this subject. But I’m stuck with just my brain for the moment, and apparently it has decided that it’s Friday afternoon and time to pack it in for the day. Oh well. Remembered another smoky! Madhat Scents Embers. Sympathize with the Friday afternoon, I’m doing the same. Also – it’s probably too masculine (even) for me – and is also rather dry, but I think Miller Harris’ Feuilles de tabac is quite intriguing. Whenever I try it I sniff my arm all day! I have not tried the SMN in ages…must get to one of their boutiques and try everything again. Perhaps you’re already aware that there is one at Friendship Heights in DC, well stocked with a great SA the time I was there. That’s the one I was thinking of, actually! Although not sure when I’ll get down there next. Of what I have smelled Nostalgia and Tobacco Toscano are my favorites, though Muschio is a lovely light bourbon-vanilla skin scent! Thanks for another excellent review, Robin! I too like Eaux des Baux, which I bought for my husband before I realised he really meant it when he said he didn’t want to wear fragrance. I like it for me, fortunately, and I like to recall my visit to the hilltop town in Provence. Ah, that would be a nice visit to recall. I just read some reviews, and plenty of people do smell tobacco in EdB like you do. I applied a tiny spritz of EdB before bed and I’m enjoying its cypress-vanilla goodness. It is so strong that I will never finish my bottle. Kindcrow, I like it too, and also don’t get much tobacco. Bf does wear scent sometimes, but only for me and I’m hoping I don’t one day find out he actually hates wearing scent! Tobacco is a favorite of mine for fall. The only one I actually own is Chergui, but I like Fumerie Turque, Tobacco Vanille and Eaux des Baux. I didn’t care for the Miller Harris one much, but I think it was a little more “men’s cologne”-ish than the rest. I haven’t really fallen for any of the Kerosenes I’ve tried (maybe Pretty Machine, but even that one had something that read a bit harsh to me), but I’d like to try this one. I was hopeful about Jasmin et Cigarette, but it ended up being a little too true-to-life for me. I wore the sample to work one day, and I kept getting whiffs of it while sitting at my desk and thinking “is somebody smoking in the building?” and then realizing it was me. Hey, Happy Birthday Sweetgrass. Tomorrow, right? (I’m afraid I’ll forget. Have a feeling this one will be too much cigarette smoke for you too, but worth a shot! Another good review, and you’ve reminded me that this is a line that I keep meaning to try. Favorite smoke: Bois d’Armenie. Favorite tobacco: Mecca Balsam. And the actual Armenie papers, the ones Francis Kurdjian did as a limited edition for the Armenia year — that is one I am dying to see made into a perfume. I love that smell. I wish Kerosene sells travel-sized bottles! Broken Theories sounds like it’s worth a try! Some of my favorite perfumes with tobacco include Chergui and Volutes EDT and EDP. Ditto and double ditto!! 100 ml is way too much. Yes, always smaller bottles and his bottles look so cool online that a coffret would be wonderful. From what I’ve read, John Pegg has experience in the auto industry and paints the bottles individually…..maybe 100ml is easier to paint? I like so many Kerosene scents but I can’t justify a 100ml purchase unless it’s something I’m just insanely crazy about and probably not even then. I’m not much of a fan of “smoky,” but I did really enjoy sampling LL Patchouli 24 and whatever that Cartier thing was… Trezieme Heure, maybe? As in, wouldn’t *wear* them, thought they were fantastic to sniff. As for tobacco, I liked Eau des Baux (wonder if I could get the SO to wear it? or either of my sons? probably not) and TF Tobacco Vanille. And Havana Vanille, though to be honest that one was a little too flat and sweet for the first three hours and then really gorgeous. Favorite tobacco is hands-down Tabac Aurea. The Kerosene does not sound like my sort of thing at all, but I’m kind of glad it exists. I love Havana Vanille, but don’t think of it as a tobacco fragrance (although it does have noticeable tobacco). They discontinued, I think, which is way too bad. And I will say the same of Tabac Aurea — not for me, glad it exists! Many of my favs have been mentioned. I find the fantastic Miller Harris Fleurs de Sel smoky. Another I don’t remember, thanks! I would love to try this, I like quite a few Kerosene perfumes but as I mentioned above the bottles are just too big for me to justify. My favorite smoky scent is woodsmoke – Imaginary Authors Memoirs of a Trespasser smells like a campfire and it’s a big favorite for fall and winter. Not sure I have a tobacco scent in my collection although I do have a sample of SSS Tabac Aurea that I like. You’re not alone in not liking Tobacco Vanille, and sadly Chergui smells awful on me although on paper it seems like it would be great. Glad I am not alone, seems like such a huge favorite. I’ve never smelled it, but I can’t to do so. Kerosene has quality fragrances. One more to add–when I wore Azemour this week, I thought maybe I was hallucinating, but is there kind of an ashen (or less euphemistically, ashtray?) note to it? I felt like I must just be having an off day, but as I nose around (ha ha), I see Kafkaesque caught a whiff of something similar… anybody else? Is it just the two of us? Oh, interesting. Wonder if that’s something about the hay / dried grasses. To me, smoky and tobacco are not necessarily the same thing. I think of scents like LL’s Patchouli (cannot recall what number) with its birch tar, as quite smoky. I love my Goodsir’s Bois s’Ascese which is a dry incense scent with plenty of smoke. My Chergui has some sweet pipe tobacco, but I get more sun-heated hay than smoke from it. I am a big fan of Tabac Aurea, which smells to me like dried tobacco leaves, resins, and woods, but somehow manages not to be sweet. There are those sweet pipe tobacco/leather scents like Scent on Canvas’ Brun Sicilien, which are not smoky…and then there are a number of scents, none of which I have tried (or at least can recall!) that have a distinct cigarette note… but again, is that smoky, ashy, or something else altogether? I h a t e Tobacco Vanille. I find it suffocating, cloying and regard its composition as an exercise in vulgarity. There. Ha wow I had no idea!! Hilarious. Is it weird that this makes me more curious to smell it? Ordinarily a tobacco-vanilla pitch is just generically uninteresting to me, but an exercise in vulgarity! Now you’ve got my attention! ha! Maybe I should become a fragrance marketeer? I think my approach is quite refreshing on Planet Perfumespeak.